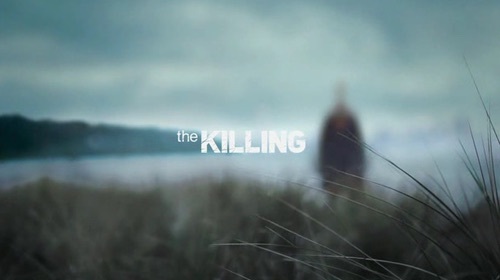 Netflix & AMC SHOW "The Killing": A Deceptive Theme of Deception. This show has such a tortured production and "broadcast" history. I almost shy from watching it, for fear of the massive disappointment so many critics and viewers reported experiencing even at the end of the first season. But rather, the atmosphere of the show, both the "inner" or psychological atmosphere and the "outer" or physical atmosphere. The physical atmosphere, or more accurately the location setting of this show, is a very dark and rainy Seattle (although shot in Vancouver). But it's actually the fact that that setting reflects the inner atmosphere, which makes the show so fascinating for me. Although the murder of a young teenage girl, and subsequent investigation and it's effect on the cast of characters, and the public, appears to be what the show is about, I don't think that's what it's about. I think it's actually about the way people lie to each other and to themselves. The murder and the investigation bring these things to the surface. And there they stay, actually starring in the show. This gives the show an even darker atmosphere than just a horrible crime and tragedy and the investigation itself. Because, it often feels like what the show is saying is, that while the murder is a horrible thing, it's not something that happens everyday, and therefore not the worst thing. The thing that is far worse, is the miscommunication, and lack of connection, that people often experience in every day life, because of the lies they tell themselves and each other. Almost like we are killing ourselves everyday by our deception and misdirection in our relationships. This makes the show almost unrelentingly bleak. But part of what I like about the show, is the way this presents almost a message without telegraphing it, or pushing it "on the nose". It's actually a cautionary tale. A tale calculated, not only to keep us in suspense, but also to try and wake us up to the dangers of deep inner and outer deception. I'm still only on the first season, the fourth episode. It will be really interesting for me to see how long they can keep it going with this psychological "hat trick" (especially since it was almost canceled twice, even before Netflix pick it up to produce the short fourth season of six episodes). I find this show to be interesting on a psychological and spiritual level because of this inner message. But definitely not for everyone, if only because of this aspect of not satisfying expectations of tension and resolve, typical in most murder investigation and detective series. I don't have any spoilers handy, but for those looking for the satisfaction of "mystery solved", it might not be available here, at least in the standard way usually provided by this genre - if at all, according to a lot of the reviews I just skimmed. But for those who like to look below the surface, this might provide a different kind of interest and mystery.